Prior to our visit to Galiano, our team of seven city gals expected a lot of labour intensive field work in less-than-ideal weather. However, we were not expecting the incredible hospitality, local food, and educational experiences that Galiano and its community members had to offer. Between a tasting of apples from Sunshine farm, a fantastic dinner comprised of house-smoked salmon and local Cable Bay produce, as well as a tasty breakfast prepared by Alison Colwell at the community hall, we were thoroughly exposed to all of the bounty that the island has to offer. Finishing our visit off with a few hours preparing soup from locally harvested produce in the community kitchen was a perfect way to “close the loop” of the food system we had been examining. 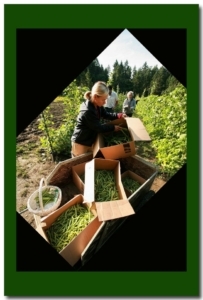 Our visit to Galiano was the best example any of us had ever seen of “building a community through food.” The use of the honor system to distribute goods, and volunteer labour being happily exchanged for fresh vegetables, are merely dreams for greater Vancouver. We were shocked to learn of the huge variety of food the island is already able to grow, and to see that Galiano residents are so willingly involved in their food system. We would like to thank the owners of the Weaver’s Cottage, Lynn Jennings and Peter Reiner, and the Captain’s Quarters, the Schnare’s, for providing such great accommodation for the seven of us over our weekend stay. As well, we would like to thank Janice, Alison, Leo and Jane for having spent so much being our guides and ensuring we had the opportunity to see the highlights of what Galiano has to offer. Further thanks to all those we had the privilege of meeting during our stay (Roger and Lisa Pettit, Henny and Thomas Schnare, Sharon Masui, Therese Ramond) and who took the time to answer our questions. 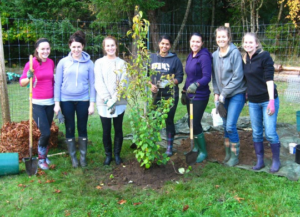 Without having visited Galiano Island, our group would not have been able to fully comprehend the scope of the island’s ability and efforts towards achieving a secure food system and promoting a sustainable lifestyle. We look forward to returning to Galiano to lend a helping hand and witness any further progress of their already admirable food system. 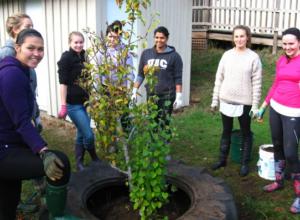 As part of the ongoing fruit tree project a wonderful opportunity has come our way: the chance to learn about planting fruit trees and bushes up at Sunshine Farm. With the help of a backhoe we will be planting Chinese pears, walnut, olive, chestnut, grapes, Saskatoon berry, blueberry and apples. We will also get a chance to help pick apples. We will meet at the Hall at 12:30 to carpool up or if you are already up island we will meet you there at 1:00. PLEASE RSVP as we can only accommodate a maximum of 8 people. On October 8th the Galiano Club’s Blackberry Festival was held. For decades now, the Club has been holding a Blackberry Tea/Festival on the Saturday of Thanksgiving weekend. No one seems to know exactly when it began, only that it is an island tradition. The Blackberry Tea is the main fundraiser of the Galiano Club. If anyone does remember when it began please contact us at 2175. We would love to be able to document the beginnings. This year the blackberry abundance was amazing and many people picked and froze berries for the Festival pies. The irrepressible Kathy Benger, at 90, picked over 24 litres. Pie production began on Wednesday, October 5th with a pastry workshop led by Alison Colwell, one of two part-time Community Food Program Coordinators. Over 200 “bottoms” were made in 2 hours. This was followed by 150 “tops” on Thursday. Friday was a soup making and baking day, along with the set up and decorating of the old Hall. 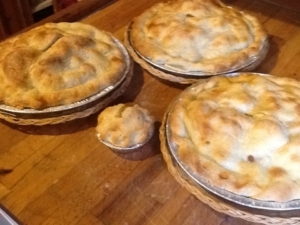 Over 150 blackberry, blackberry-apple and pumpkin pies were baked and this year for the first time unbaked frozen pies also were available for sale. Our Junior Club members were showing up the old pros when it came to crimping the pastry. Saturday began as a misty, cool fall day. In the early morning, people were in the Hall heating soups, slicing pies and organising the dishwashing. From the moment the doors opened at 11:00 a.m. until 3:00 p.m. there was a non-stop whirlwind of activity. A team of volunteers served 200 bowls of 10 types of homemade soups, buns from the Sturdies Bay Bakery, over 200 pieces of pie with ice cream, endless cups of regular tea, fresh mint tea and Galiano Coffee Roasting Company coffee. The soups ran out at 2:00, the pies were all sold by 3:00. Inside and outside the Hall were tables of produce, bread, canned goods, native plants from the Galiano Conservancy Native Plants Nursery and spun wool items for sale. This was the final day of the Galiano Saturday Farmers’ Market. Not including the berry pickers, there were over 40 individual volunteers involved (the list will be published next month), many of whom were involved in more than one day of the activities including hours of dishwashing and clean up. Also among the volunteers was an enthusiastic contingent from the Galiano Club Junior Membership (from ages 5 to 18). It’s always a wonderfully chaotic community event. Thank you to the Galiano community for supporting the Blackberry Festival and remember to mark Saturday, October 6th, 2012 in your calendars! Bluffs Park Lookout Road: Rick Gill and Andy Turner from our highways maintenance company, Mainroad, approached the Galiano Club with an offer to repair the “spur” road that leads from Bluff Rd. to the Bluffs lookout. This spur road has been in very bad condition for a number of years. Because the Bluffs are designated “nature protection”, very little alteration can be done within the park. The Islands Trust Planner has approved the road repair work which will include new gravel and ditching as well as adding fill in the lookout parking lot that is a lake for much of the winter. This work will begin mid-October and will take about 3 days. This donation by Mainroad is an incredible community benefit. It would have taken the Galiano Club a long time in which to raise the money for this project. Thank you Mainroad! For me, the harvest season brings out deep and ancient yearnings for tribe, clan or family…. What ever that is that makes us feel safe, loved and gives us the sense of belonging to something bigger. Since the industrial revolution and the shift to the nuclear family model something changed how we played out the bringing in of food to carry us over the dark and cold months of the year. An isolation from the larger group began to form. We are inherently a tribal animal….. for tens of thousands of years we relied on one another for survival. It is only through study that we begin to understand these vague yearnings for ritual and togetherness. These days it is through our food program that so much of these clannish cravings are being met for me. From planning crops that suit soup making by and for seniors to digging holes for fence posts at the school garden these activities satisfy the communal soul in me. When strangers email that they have an orchard that they would like to share the fruit from or an extra food dehydrator some rich chord is struck inside. Learning skills like salmon smoking or foraging the shores of Montague allows those of us long out of touch with providing for ourselves to follow those who have never forgotten. 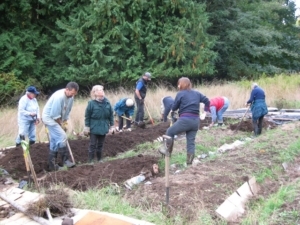 Friendly farmers ready to share labour for food seem to sprouting up all around us and it is through agriculture this summer that a new part of Galiano’s Food Program has grown. The challenging aspects of growing food are that it is a somewhat unpredictable yet demands constant nuturing dare I say commitment. Even on these laid back islands we are as busy as ever with jobs, children and domestic responsibilities not to mention the variety of community responsibilities in a small community that wants to enjoy the same richness as larger populations. So balancing yet another element, food production, becomes a whole added layer. I would point out though that not only is the quality of produce exceptional the connections made to the Earth and each other in the field over the course of a season are phenomenal. I am both humbled and exhilarated by growing food with friends and neighbours. We are simultaneously students, teachers, scientists and spiritual warriors when we undertake such lofty projects as this. So my advice to anyone, anywhere would be to join in with your local efforts to honour the ancient pull in us to share our efforts and food as often as possible. The joy in the communal is the closest thing to happiness I have felt in my 50 years. For decades now Galiano residents have relied on regular transportation of food if not by our own steam than one of the storeowners here. But like most other places in North America both urban and rural there has been an awakening to the prospect of rekindling our agri CULTURE. It’s not just that we are preparing for the oil situation to force us in to local production; it’s much richer than that…. It seems to me that humans actually not only enjoy watching the fruits of our labour, but that we like to do it in a group ! The willingness of the growers in the community to put time in to teaching us how to lay irrigation, pick seed and sites as well as understanding harvesting techniques saves us the overwhelming heartbreak of failed crops. This sharing is going on all over the island and I hear of fresh approaches every week. As well, working in a group or in partnerships allows us to come and go a bit depending on work and other responsibilities. The comraderie in the field has been a real delight and I don’t think I’ve laughed as hard at my own misconceptions and mistakes ever. There is truly a gentle generosity in what has been happening between growers of all stripes here. One of the new parents on the island announced the other day that they chose Galiano over another home because of the fact that we have a greenhouse and garden at the school. Whoa ! The harvest is coming fast in these last weeks of October and already innovative ideas are flowing about various partnerships and commitments to each other towards health and community for the new year’s crops. It is wonderful to connect on such an important but uncomplicated issue as FOOD. Admittedly, I am looking forward to the brief pause in growing that we have here on the west coast and dreaming of the seed catalogues and inspiring plans that Galianoites always come up with. Until then, don’t hesitate to join us picking and processing the end of the season’s bounty. Just email or phone Alison or me. 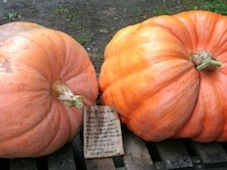 Always a pleasure …..
Friday, October 21st, at 1:30pm at the South Hall, we’ll meet to prepare, cook and divide up the two Giant pumpkins donated by Roger and Lisa at Sunshine Farms. Bring a container, because all volunteers will be leaving with pumpkin, and bring your biggest spoon as we try to retrieve all those seeds for roasting. USING PREMIUM SEED AND A LARGE AREA TO PLANT IN at the end of Morgan Road in a quiet tree-rimmed field. Regular work parties (approximately one per month) for 10 months lasting 1 1/2 – 2 hours each; participation level determines volume of garlic received. 1200 premium Boundary Garlic cloves going in: Porcelains and two types of purple stripe: Persian Star and Chestnut Red all are hard neck producing scapes in the Spring. Cost of membership is $20, which covers seed and amendments, the Food Program is covering coordinating costs. 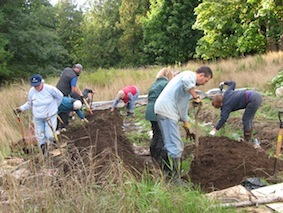 This year we will have the helping hands of 6 UBC students to turn the earth in the new bed as part of their agricultural studies. FIRST ‘PARTY’ WILL BE TUESDAY, OCT 11 AT 4:00 , planting Mon.Oct 17 at 4:00 EMAIL IN YOUR PARTICIPATION OR SIMPLY SHOW UP WITH GLOVES, SHOVEL, FORK and wood ash if possible. 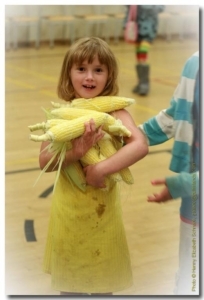 When I volunteered to provide corn on the cob for the Community Picnic on behalf of the Galiano Emergency Program, little did I realize how much was involved. It wasn’t just a matter of arranging for the purchase of the corn – it was also planning for the shucking, cooking, and serving of the ears, as well as arranging for disposal of the cobs and husks. Well, thanks to the experience and resourcefulness of Janice and Alison, I now know about bringing tarps and getting the children to make the corn shucking into a contest, arranging for BIG pots and cooks (of any size) for cooking, having runners available to scoot the shucked corn to the cooking pots as quickly as possible, getting the delicious cooked corn into people’s tummies equally rapidly, and recycling the husks and cobs into compost Buying the corn is definitely the easy part! In addition to Janice and Alison, my heartfelt thanks go to the Daystar Market (suppliers of the sweetest corn imaginable), Mary and Don Thomson (scooters extraordinaire), Eileen Beaudine (contest super-organizer and official cob counter), Dana Weber (brilliant not only with baking wonderful bread but with cooking corn to perfection as well) and Barry New (community compost expert). After all the corn scurrying was over, we were all able to sit down and enjoy a fabulous potluck with super pesto and/or salsa and chips, devilled eggs, fabulous salads, eggplant casseroles, macaroni casseroles, rolls, pies, cookies, berries, homemade ice cream, and a whole bunch of other things that were gone before I even got there ☺ The empty plates were dead giveaways of truly tasty concoctions. And all through this, we had great music provided by Jenny Brooklin alternating with Greg Gammon. But I think that everyone would agree that the activity which topped everything was the Great Zucchini Race, emceed and conducted by Thomas Schnare and capably judged by Dave Ages and Mike Hoebel. The engineering, creativity and just plain fun were unbelieveable. Well done organizers – I can hardly wait until next year! We will be celebrating Apples at the 3rd annual Applefest at the Galiano school on the afternoon of Thursday October 13th from 12:30-3:15. 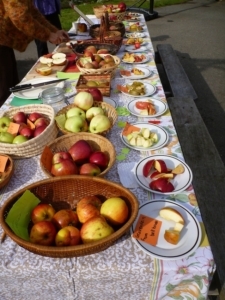 During the afternoon, we will be juicing local apples with the kids, playing apple related games, hosting an apple tasting, and the teachers will be leading the kids in apple poetry, and an apple art project. We need a few volunteers to help with the various stations, and to help the kids move smoothly between them. If you can help, call Alison.